Tech O Blog : Windows 9 : Virtual Desktop in action ! Windows 9 : Virtual Desktop in action ! 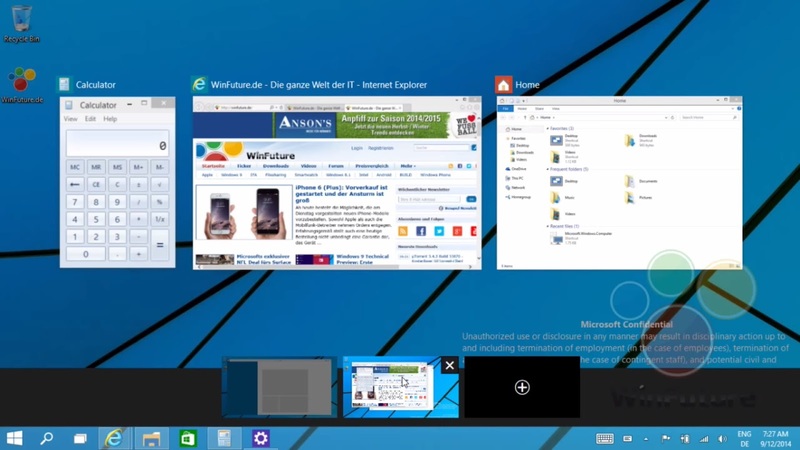 Want to get a taste on how Windows 9's virtual desktops work ? Here is the answer in the form of a video. Here is a short overview, You can open up to 7 virtual desktops in total and you can run different apps in different desktops. When you have open applications in different desktops, you can hover over the desktop to see what's running inside and directly go to your application of your choice. Virtual desktops may be a bit confusing for average Joe's out there it is turning out to be a important and very useful feature for the power users in Windows 9. Windows had this feature for long enough but this the first time that this feature is built right into the core of Windows.Most of the Linux distros had this feature but implemented in a different manner, overall the native Windows implementation looks solid and easy to use.Microsoft is putting much more focus in the desktop right now and is yet to improve the Start screen and Start menu is now well integrated with Windows. So do you think that Virtual desktops will make Windows much more easier to use and how will it help you to boost the productivity of your work ? Virtual Desktops could prove helpful to run multiple resource intensive applications. Indeed its good for power users.